The usage of the album-equivalent units revolutionized the charts from the "best-selling albums" ranking into the "most popular albums" ranking. The International Federation of the Phonographic Industry (IFPI) have used album-equivalent unit to measure their Global Recording Artist of the Year since 2013. Beginning with the December 13, 2014 issue, the Billboard 200 albums chart revised its ranking methodology with album-equivalent unit instead of pure album sales. With this overhaul, the Billboard 200 includes on-demand streaming and digital track sales (as measured by Nielsen SoundScan) by way of a new algorithm, utilizing data from all of the major on-demand audio subscription services including Spotify, Apple Music, Google Play, YouTube and Xbox Music. Known as TEA (track equivalent album) and SEA (streaming equivalent album) when originally implemented, 10 song sales or 1,500 song streams from an album were treated as equivalent to one purchase of the album. Billboard continues to publish a pure album sales chart, called Top Album Sales, that maintains the traditional Billboard 200 methodology, based exclusively on Nielsen SoundScan's sales data. Taylor Swift's 1989 was the first album to top the chart with this methodology, generating 339,000 album-equivalent units (281,000 units came from pure album sales). On the February 8, 2015 issue, Now That's What I Call Music! 53 became the first album in history to miss the top position of the Billboard 200 despite being the best-selling album of the week. In July 2018, Billboard and Nielsen revised the ratios used for streaming equivalent album units to account for the relative value of streams on paid music services like Apple Music or Amazon Music Unlimited versus ad-supported music and video platforms such as Spotify's free tier and YouTube. 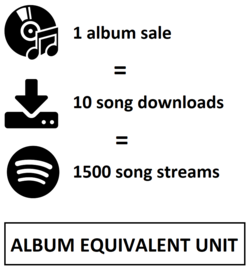 Under the updated album equivalent ratios, 1,250 premium audio streams, 3,750 ad-supported streams, or 3,750 video streams are equal to one album unit. Similarly the Recording Industry Association of America, which had previously certified albums based on units sold to retail stores, began factoring streaming for their certifications in February 2016. In the United Kingdom, the Official Charts Company has included streaming into the UK Albums Chart since March 2015. The change was decided after the massive growth of streaming; the number of tracks streamed in the UK in a year doubled from 7.5 billion in 2013 to just under 15 billion in 2014. Under the new methodology, Official Charts Company takes the 12 most-streamed tracks from an album, with the top two songs being given lesser weight so that the figure will reflect the popularity of the album as a whole rather than of one or two successful singles. The adjusted total is divided by 1000 and added to the album sales figure. Sam Smith's In the Lonely Hour was the first album to top the chart with this rule. Out of its 41,000 album-equivalent units, 2,900 units came from streaming and the rest were pure sales. By the end of 2017, The BPI reported that streaming now accounts for over half of music consumption in the UK (50.4%). In Germany, streaming began to be included on the albums chart since February 2016. Nevertheless, German Albums Chart is used to ranking the albums based on weekly revenue, instead of units. Hence, only paid streaming is counted and should be played at least 30 seconds. At least 6 tracks of one album have to be streamed to make streams count for the album, with 12 tracks being the maximum counted. Similar to the UK chart rule, the actual streams of the top-two songs are not counted, but instead the average of the following tracks. In Forbes.com, Hugh McIntyre noted that the usage of album equivalent units has made artists release albums with excessive track lists. Brian Josephs from Spin said: "If you’re a thirsty pop artist of note, you can theoretically game the system by packing as many as 20 tracks into an album, in the process rolling up more album-equivalent units—and thus album "sales"—as listeners check the album out." He also criticized Chris Brown's album Heartbreak on a Full Moon which contains over 40 songs. ^ a b "Taylor Swift's '1989' Returns to No. 1 on Revamped Billboard 200". billboard.com. Retrieved 1 July 2016. ^ a b Trust, Gary (2014-11-20). "Billboard 200 Makeover: Album Chart to Incorporate Streams & Track Sales". Billboard. Retrieved 2014-11-20. ^ Caulfield, Keith (May 22, 2016). "Drake's 'Views' Rules at No. 1 for Fifth Week on Billboard 200 Chart". Billboard. Retrieved July 2, 2016. ^ "Global Recording Artist of the Year". International Federation of the Phonographic Industry. Retrieved November 11, 2017. ^ "Why Is Taylor Swift Still #1?". pitchfork.com. Retrieved 1 July 2016. ^ Book, Ryan (February 12, 2015). "Now 53 Outsells Taylor Swift, Becomes First Record to Top Albums Chart but Not Billboard 200; Kid Ink Cracks Top 10". The Music Times. Retrieved July 2, 2016. ^ Sisario, Ben (July 9, 2018). "The Music Industry's Math Changes, but the Outcome Doesn't: Drake Is No. 1". The New York Times. Retrieved September 25, 2018. ^ Tsioulcas, Anastasia (February 1, 2016). "Forget Selling Albums — Artists Can Now Go Platinum Via Streaming". NPR. Retrieved February 21, 2019. ^ a b "Sam Smith's 'In the Lonely Hour' Tops Historic U.K. Albums Chart". billboard.com. Retrieved 1 July 2016. ^ "Official Albums Chart to include streaming data for first time". officialcharts.com. Retrieved 1 July 2016. ^ "Drake's Official Top 40 most streamed songs". Retrieved 2018-01-30. ^ "Deutsche Album-Charts integrieren Premium-Streaming" (in German). Musikmarkt.de. February 1, 2016. Archived from the original on February 1, 2016. Retrieved 1 July 2016. ^ Briegleb, Volker (February 1, 2016). "Deutsche Album-Charts jetzt auch mit Streaming-Zahlen". Heinz Heise. Retrieved 1 July 2016. ^ "How Longer Albums And Streaming Giants Are Manipulating The Charts". Forbes. 2017-08-17. Retrieved 2018-08-05. ^ "Why Does Chris Brown's New Album Have 40 Songs?". Spin. 2017-05-02. Retrieved 2018-08-05.